Just a couple days ago, a few more of my eBay purchases came in the mail. First up is this Matchbox Models of Yesteryear 1930 Ford Model A Van. This is one of the more common Yesteryear castings, done up in what I think is a period-style Canada Post livery. I’m not really a Yesteryear collector, but I spotted this one for cheap, and I have a thing for Canadian stuff represented on diecasts, being in Canada and all. I also got four post-Universal Matchbox (1982-1992). 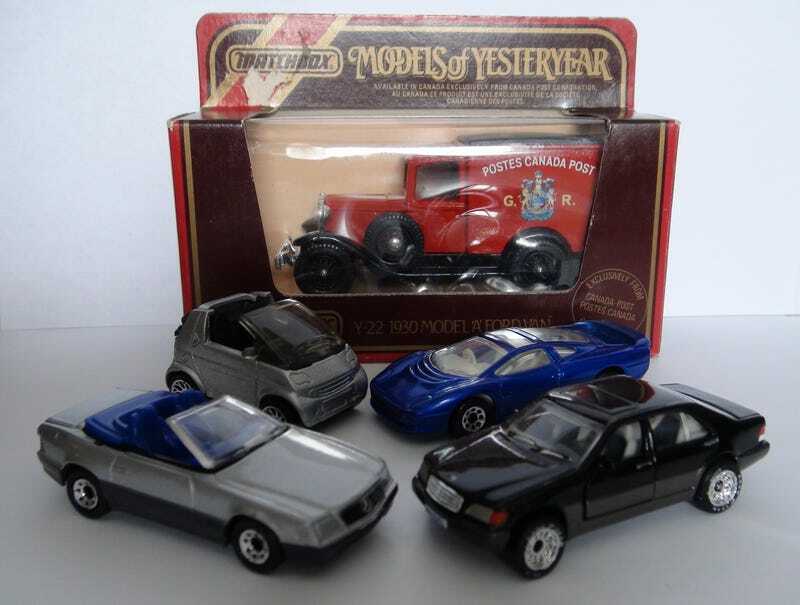 Generally speaking, I try to stick to buying Universal-Era Matchbox (and older Majorettes, and older Tomica) on eBay, but these still have the realism and detail of the releases during the Universal Era. The star of the show was this Swop Tops Mercedes-Benz 500SL, as I previewed before. Swop Tops was a 1993-only series of 6 cars which could switch between having a closed top and an open top. As mentioned before, these are some of my Grails of Matchbox collecting. Look for this one in a full-detail feature sometime soon! I got a Jaguar XJ220 from its mainline debut in 1993 in this lovely purplish-blue colour. I also picked up this silver Smart Fortwo, since I already had two, and this one was both inexpensive and the ROW-only first release, from way back in 2002. Most expensive, however, was actually this 1996 World Class Release 2 version of the Mercedes-Benz 600SEL. I paid more than I probably should’ve, and the listing didn’t mention that it actually has one mismatched wheel on the side not pictured, though it was in mint condition as described.